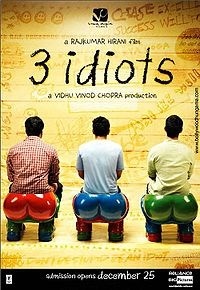 Recently, I watched the much talked about Bollywood movie 3 Idiots, starring Aamir Khan. This movie has been getting so much acclaim and buzz, that it was showing in one of the AMC Mercado 20 screens mainstream theater in Santa Clara, right next to the mega hit Avatar. Of course, in the Bay Area, California, it’s not that difficult to attract a large Indian crowd for an Indian hit movie, but it is still very rare that a main stream theater will show a Bollywood movie and that movie would be generating most of their audience for those particular days. The movie is a fantastic movie and it lives up to the hype. Before I went to watch it, I had seen on Facebook statuses and other posts on the web statements that this movie was the best movie of the decade and other legendary proclamations. So, my expectations were high going into the movie. However, unlike Slumdog Millionaire, this one fully met my expectations ( I too watched Slumdog Millionaire after I had heard statements about the greatness of that movie, so I built it up expecting that it would be one of the Top 5 movies I’d ever seen—but it didn’t meet that criteria). While it still had many of the clichés of a typical movie (not just Bollywood) where everything turns out perfect in the end and a viewer could easily anticipate what would eventually transpire, that didn’t seem to matter. The build-up to the feel good ending was successful; it didn’t matter that you knew at the end that the friends would be reunited, that long lost loves would find each other, and that the message of pursuing your dream would eventually and successfully play out. The movie reminded me of Dead Poet’s Society in many ways. In that movie, the camaraderie of private boarding school friends in the US dealing with parental and societal pressures to excel in expected careers vs their individual dreams which eventually leads to tragedy for some and personal growth and triumph for others is a very similar storyline to 3 Idiots. Robin Williams plays the Aamir Khan character, Robert Sean Leonard (now from House fame) and the Ethan Hawke character are both combined in the Raju Rastogi character. Dead Poet’s Society was a fantastic movie about pursuing your dream and standing up to societal pressures as is 3 Idiots. The depiction of friendships and bonds during college engineering days was well done. While I didn’t go to college in India, the relationships built during those days from what I understand are very special bonds and this movie represents that. The pressures, the fun, the debate and anxiety regarding the future, the friendly challenges amongst friends and nemesis, one off drinking episodes that lead to philosophical discussions, and the give and take between basically brothers all are superbly represented. Aamir Khan is the star of the movie but the ensemble cast to me is what really stands out. I didn’t come out of the movie raving about Aamir Khan, but rather the performances of all as a group seems to resonate with the audience. Khan, and the other 2 idiots, R. Madhavan as Farhan and Sharman Joshi as Raju Rastogi, along with Omi Vaidya as Chatur (the Silencer)—the groups academic rival all give fantastic performances. Omi Vaidya’s character, Chatur, was one of the memorable characters of the movie- offering a fine, comedic performance. As an Indian American myself, it’s nice to see an Indian American actor who grew up in California start to make an unexpected name for himself in a high profile Bollywood movie. Vaidya was a character on the US sitcom hit, The Office in 2007. There are still only a few Indian American actors, and we’re starting to see a few of them getting recurring roles in American television and movies such as Maulik Pancholy on 30 Rock (I know Maulik from my days in Dayton—very happy with his success), Kal Penn of House and Harold and Kumar fame (and now the Obama administration), and Pragna Desai (my cousin—who had a recurring role on ER a few years ago). As a Gujarati, one memorable scene was Kareena Kapoor’s diatribe against the ominous sounding foods of Gujarat such as dhokla, fafda, handwa, thepla, khakhra. Classic line when she says Bush just launched a dhokla on Iraq during the war. Overall, an excellent movie that I’d recommend to fans of Bollywood movies and to those who have never seen a Bollywood movie. A cross-over movie that energizes the viewer after the movie is done—a movie can’t aspire to do more than that. And to think, I didn’t even get to watch in 3D like the movie on the next screen, Avatar. Aal Izz Well. Totally agree with you…Suddenly I like Aamir Khan after watch this movie. Turseena, thanks for the comment… have you seen Aamir Khan in other movies. He’s good in this movie, but the overall cast and story is what I liked the most. I think Aamir Khan is best in Lagaan. Thanks for your recommendation, I have a friend who has so many Indian movies. I am sure he has the movie that you recommend to me. Btw, nice to know that you are from San-Francisco. I was born there but never know how this city looks like (I am living in Indonesia). Turseena— let me know what you think of Lagaan– i’m sure you’ll like it. San Francisco is a beautiful city– has a lot of Asian influence. I’ve never been to Indonesia, but it does have a bit of Hong Kong feel to it. That!s great and u get more educational learning and u learned how to value friendship. !